Author Kate Swindlehurst lives and works in Cambridge and was diagnosed with Parkinson’s in 2004. 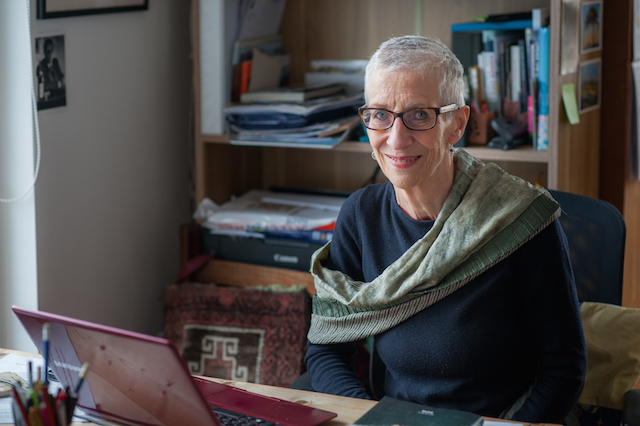 She has published several short pieces, both fiction and non-fiction, has written a novel set in Argentina and is working on a second, dealing with our responses to the refugee crisis. She took up dancing tango in 2002. When I was diagnosed with Parkinson’s in 2004, my initial response was to give up – first playing the saxophone, then running. Eventually my teaching job proved too much. Depression undermined my confidence to such an extent that I even gave up on my love affair with Argentine tango, which began in 2002. Somehow, I felt ashamed, as if the condition was something I had to hide. Fast forward to 2011: the sound of music behind a closed door as I passed by on the street outside. Those familiar rhythms, that wonderfully melancholy yearning. I stepped inside. In the semi-darkness I saw couples closely entwined moving slowly round the floor. I was hooked, all over again. As well a community of dancers to welcome me, I found teachers who were keen to explore the extraordinary impact of the dance on my experience of Parkinson’s. Together we began to write about what they discovered. 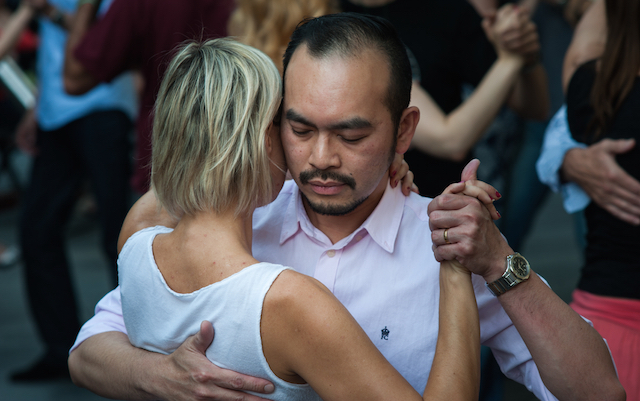 Argentine tango evolved among new immigrants in Buenos Aires and Montevideo more than 100 years ago and is now danced socially all over the world. Partners usually dance in a close embrace, often described as a ‘natural, loving hug’. Unlike other dances, it doesn’t have a set sequence of steps. Instead it is improvised, relying on an unspoken connection between the partners. For comprehensive information about dance and Parkinson’s please visit the European Parkinson’s Disease Association (EPDA) website. For me, the challenge has always been an essential part of the tango ‘medicine’. The dance demands posture, balance, flexibility, coordination and core strength – all areas compromised by Parkinson’s. The condition is often described as a ‘movement disorder’ and researchers and therapists alike have tended to focus on physical aspects such as stride length and ‘heel strike’, initiating and responding to movement, changes in speed and direction, and turning. All these are features of Argentine tango, which also incorporates walking backwards, known to help with postural instability. So perhaps it’s no surprise that the dance is beginning to be recognised for its therapeutic potential. Fortunately, given the difficulties of this most demanding dance, there is support. Although in tango you have to be responsible for your own axis, you are held by your partner and move together with him. And then there’s the music, with its power to ‘awaken’ the listener emotionally. We dance mainly to amazing recordings from the golden age of tango, the 1930s and 1940s. Combined with the intimacy of the close embrace, it can be a very moving experience – some even claim it’s a spiritual one. A glance at the faces of those who pass on the dance floor shows this clearly: one smiles in delight, while another has her eyes closed as if in prayer. In regular individual lessons, my confidence grew as I learnt to open myself to the healing potential of the dance, in the knowledge that I was in safe hands. Rather than a shameful secret, the condition became something we could work with together, pushing the boundaries of what was possible, until it seemed that even Parkinson’s wasn’t always necessarily a bad thing. 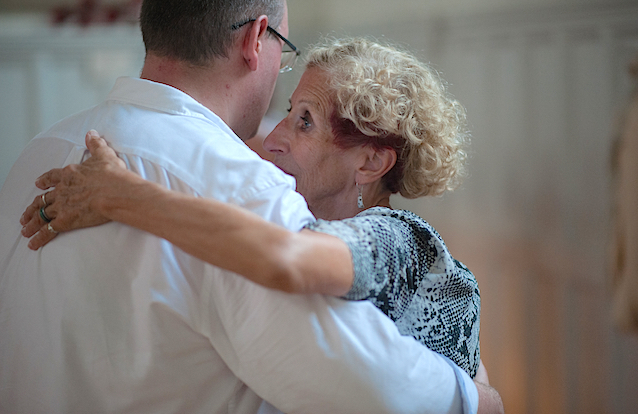 “Maybe Parkinson’s can sometimes bring something positive to the dance?” Ellie suggests. As I moved round the hall with others at the local milongas (social evenings), I enjoyed the support of the wider tango community. What’s even more remarkable is that the benefits I enjoyed during dancing lasted long after I’d taken off my tango shoes and gone home. Parkinson’s & the Tango Effect: My Year on the Dance Floor takes the form of a diary, although it is backed up with reference to the research and offers encouragement to health professionals, as well as dancers. When I wrote the book, we joked about how tango was never going to be available on prescription. Now there’s at least one health authority – Halton in Cheshire, UK – which does prescribe tango for certain conditions, along with Nordic walking and gardening. At a time when public health services are under pressure and there are calls for us all to take more responsibility for our own well-being, my book suggests a radical alternative to giving up and a living example of the way a very special dance can change your life. Parkinson’s & the Tango Effect: My Year on the Dance Floor was launched with award-winning crowd-funding publisher Unbound in December and funding is currently well under way. Tango helps with the physical aspects of Parkinson’s, including posture and balance, stride length and speed, changing direction and turning. Some movements in tango, such as stepping over or tapping a partner’s foot, mimic exercises used to treat those with the condition. Tango also addresses the emotional difficulties often experienced by people with Parkinson’s – the intimate relationship with the partner can be an effective counter to isolation. The tango community can provide inclusive social interaction, where dancers are defined by their love of the dance rather than by illness.